Fridge Filterz FFSS-375-1 cyst filter (Standard 42 & 53) 1 Pack replacement water filter is designed to fit selected Samsung* refrigerators. This premium water filter is designed to remove sediment, Chlorine Taste and Odour as well as contaminants and heavy metals including Lead, Mercury, Lindane, 2-4-D, atrazine and benzene, to name a few, that may be present in your drinking water. This refrigerator filter replaces: Samsung* Filter DA29-00020B, HAF-CIN/EXP. The FFSS-375-1 is tested to meet NSF/ANSI Standard 42 & 53, Particulate Class I, to ensure that you are getting a SAFE, quality product. Fridge Filterz are manufactured to the highest quality standard, providing you and your family with clean, fresh tasting, odour free ice and water without removing beneficial minerals and fluoride that may be present in your drinking water. All of our fridge filters are made with environmentally friendly (green) carbon. *Samsung is a registered trademark of Samsung Corporation. 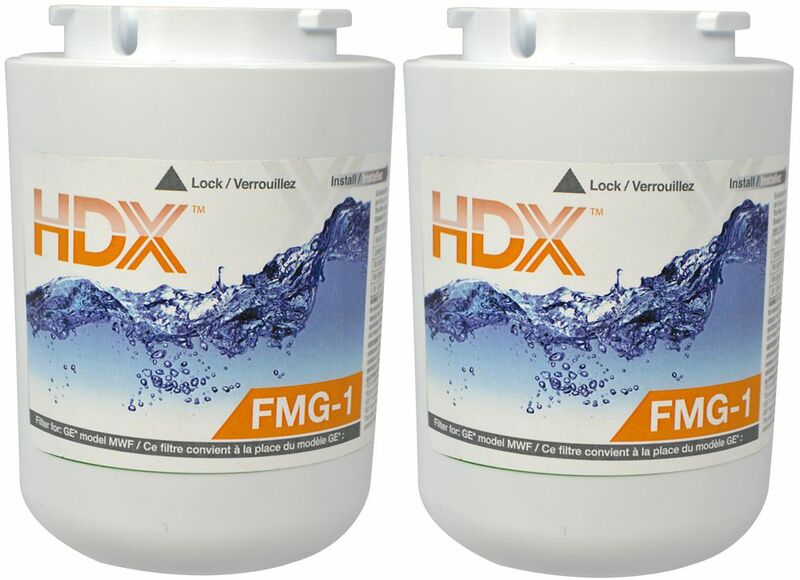 FMG-1 Refrigerator Replacement Filter Fits GE MWF (2 Pack) This premium HDX replacement refrigerator water filter fits in place of GE MWF. Engineered with the power of coconut shell compressed carbon block, this filter provides tremendous capacity to reduce impurities, sediment and rust that may be present in your drinking water. The carbon block has millions of active sites on its surface and within the structure which can absorb impurities like a sponge, and can hold other types of impurities on its surface like a magnet. Additionally, this filter can catalytically breakdown other impurities similar to the way a catalytic converter works in your automobile. These processes ensure that you are getting the cleanest and best tasting water possible. This economical filter will provide fresh and clean tasting water and ice cubes. FMG-1 Refrigerator Replacement Filter Fits GE MWF (2 Pack) is rated 1.0 out of 5 by 1. Rated 1 out of 5 by sooscotty from Left a bad taste in my mouth These generic filters are not a good substitution for the OEM filter. I only use the filter to get rid of the chlorine taste from our city water, but this filter leaves a horrible metallic taste in the water. If you fill a jug and leave it sit for a day, the taste goes away but that's no help when you want a drink now. I will stick to the OEM filter from now on.